A 42-year-old woman has confessed to slitting her mother’s throat with a chopper after returning home from church. The incident occurred on Friday afternoon at their Tempe, West Coast Berbice (WCB) home. The suspect confessed yesterday afternoon to Berbice investigators. She then led the ranks to the murder weapon used to kill 71-year-old Rookmin Jameer. 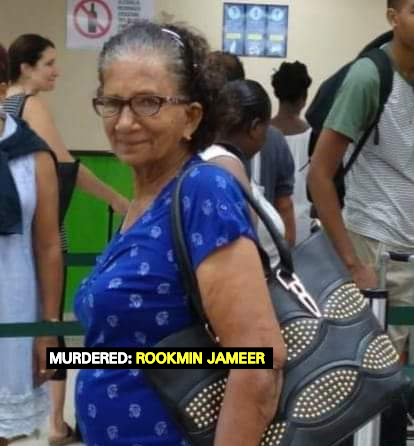 Guyana Standard has been informed that the suspect told investigators that her mother had been cursing her for the past week for stealing her money. “The woman (suspect) said her mother was tormenting her for days for thieving some money she got from foreign and she got upset,” a police source said. Based on reports received, the woman told police ranks that she had just come from church and was at the sink when her mother started accusing her again of stealing the money. The suspect claimed that she became angry and picked up a chopper that was nearby and fired a chop at her mother. “She (suspect) said she didn’t expect to kill her mother but out of frustration she fired the chop to scare her away,” the police source said. On Friday afternoon, it was the suspect who called out for neighbours in panic and said she discovered her mother’s bloodied body when she returned from church. However, she was taken immediately into police custody after neighbours told investigators that two days before the elderly woman was killed, she expressed fear for her life and claimed that her daughter had threatened to kill her. Relatives also claimed that the deceased told them that her daughter threatened to pour hot water on her if she left the house to go to the police station.